It was just over a year ago that Atlanta ABC affiliate WSB-TV grabbed attention for its “14 box” team coverage graphic during a winter storm — and now a Dallas station has followed suit. 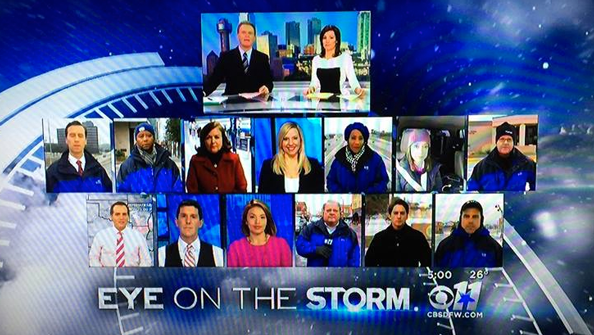 KTVT-TV, the market’s CBS O&O, presented its coverage of the winter storm bearing down on the region under the “Eye on the Storm” banner — and gave viewers a look at all 13 reporters it had dispatched to cover the story. The graphic was spotted by local viewer and NewscastStudio reader Christopher Thornton, and later picked up by local media. We’ll see if KTVT-TV, meanwhile, follows in WSB-TV’s footsteps and pulls out an epic “25 box” tomorrow, just like the Atlanta station did in January 2014.